This is the very first image I ever created. It's based on a call I attended where a young man in his early twenties died while we were trying to save him. I remember him calling for his mother. Although he was a man in his twenties he called for his “Mommy, Mommy, Mommy!” as he died. He was killed by a drunk driver. When I finished this piece I kept it to myself for a long time and wasn't going to share it. 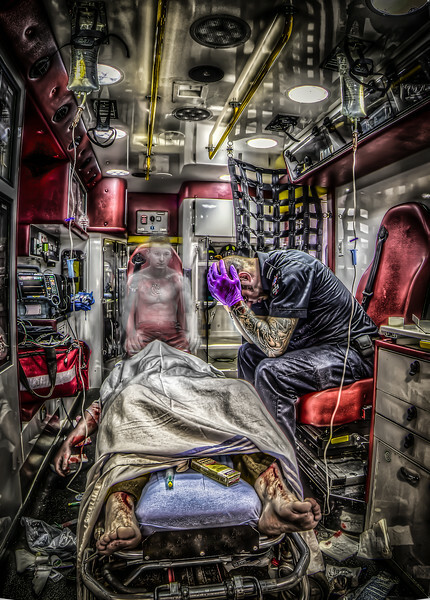 I was scared what my fellow first responders would think if I showed a vulnerable side to our profession. Things are a little better now but the negative stigma toward PTSD and occupational stress injuries is still very real. This is so powerful and amazing I'm at a loss for words. You've really hit home. Thank you. Extremely Well Done! otherwise speechless! !